Well, yesterday, I got back to preaching regularly. 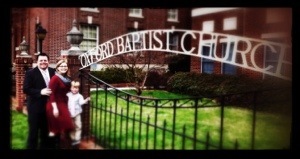 This time, it is in Oxford, NC for my new call to serve as pastor to Oxford Baptist Church. It was a great Sunday. The children sang and led in worship. Natalie, Cam and I joined the church. It was Pentecost Sunday. All in all it was a celebratory kind of day and we are thankful to have been a part of it. As always, you can check out sermons regularly on iTunes or on BuzzSprout.